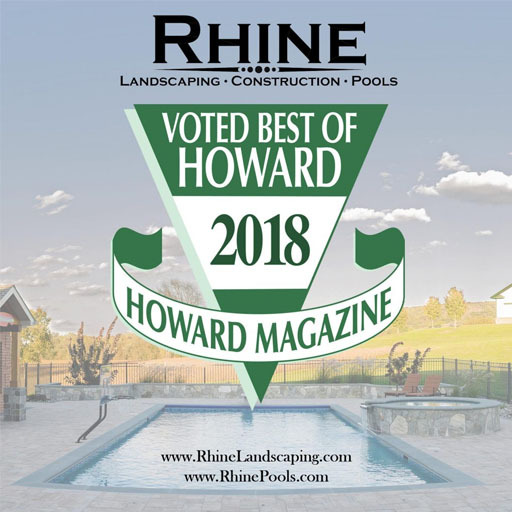 Rhine Pools is a pool contracting company in central Maryland that was born out of a need for a better approach to pool building and contracting. Jay Rhine and his landscaping company were working as subcontractors to other pool builders more than 15 years ago and found that clients were frustrated by having to keep track of all the pools builder’s subcontractors themselves, and that customer service was lacking. So, he created Rhine Pools to offer a different approach to pool building, one that was oriented around the needs of the client. Here’s how Rhine Pools stands out as a pool contracting company. All of our projects have a dedicated project manager. If you have any questions or concerns during the process, your project manager will have the answers. We believe it shouldn’t be the customer’s job to keep track of the status of the project, and that they should have a single point of contact they can go to at any time with questions or comments. Customer service is another hallmark of our pool contracting company. We believe everyone should be treated with respect. That means timely responses to inquiries, and no hidden costs that drive up the bill. Pleasant interactions with our customers are a point of pride for us. We love designing pools as much as you’ll love your new pool. We’re not content to build a standard design that you’ll see some variation of in any old backyard. You want your pool to be unique, and we want to help you realize your vision for a one-of-a-kind pool. Our experienced landscaping professionals go beyond your pool to integrate it into the surrounding landscape to give your pool a natural and inviting appeal. And unlike other pool builders, we’ll work to ensure your backyard can accommodate a pool. If others have told you it can’t be done, Rhine Pools will tell you how we’ll do it. Does your vision for a new pool include a total redesign of your backyard that includes new landscaping, hardscaping, and outdoor structures? So does ours. 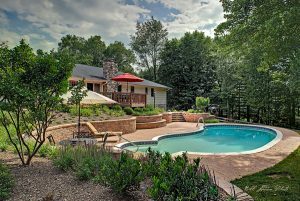 We’ve helped many homeowners in the central Maryland area realize their vision for their own personal oasis right in their backyard. As the centerpiece of your backyard, the pool shouldn’t stand on its own. 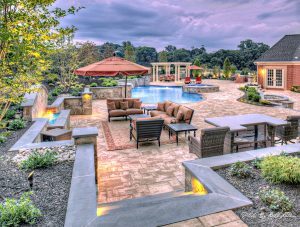 With custom landscaping, hardscaping, and features such as pool houses and outdoor kitchens, your pool becomes part of an entire outdoor living experience. 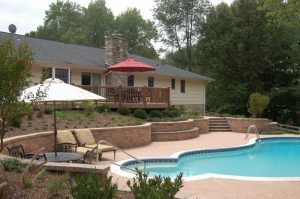 In addition to new pool construction, we also do pool renovations and rebuilding. Every pool will reach a point in its life where it could use a facelift. We can refinish your pool with a new PebbleTec finish, or replace your old plumbing and electrical equipment with modern versions that are more efficient and make maintaining your pool easier than ever. From design and installation to renovations and rebuilding, you can trust Rhine Pools, your pool contracting company in Maryland.